In 2002, Jeff Lane established Lane Motor Museum. 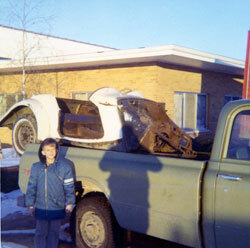 Jeff has been an automotive enthusiast since an early age. He began restoring his first car—a 1955 MG TF—when he was a teen. His personal collection was the donation that began the foundation. Lane Motor Museum unveiled its collection to the public in October of 2003. As director, Jeff Lane continues to search out cars for the collection that are technically significant or uniquely different. The goal of Lane Motor Museum is to share in the mission of collection and preserving automotive history for future generations. The Museum is a non-profit 501(c)(3) organization. Lane Motor Museum is one of the few museums in the U.S. to specialize in European cars. It is a working museum with the goal of maintaining all vehicles in running order. Some cars are in showroom condition, while others represent typical aging. Efforts are made to restore each vehicle to near-original specifications. The mission of Lane Motor Museum shall be to collect, preserve, document, and interpret an eclectic and technically interesting collection of cars and other transportation-related objects for the purposes of educating the public about the history of transportation.